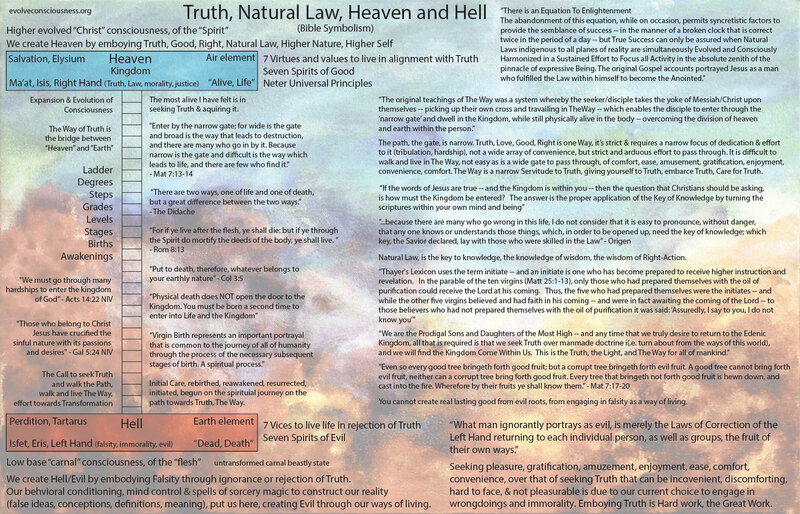 This is a graphic to illustrate the symbolism in the Bible regarding what Heaven and Hell actually is. They are states we create in ourselves, and in the world as a result of externally manifesting our consciousness in the aggregate together, collectively co-creating the world we all live in. Heaven and Hell is our responsibility to create here in this reality, on this planet. We have great power, and with that power comes great responsibility. We can choose to align, embody and walk The Way, Truth, Love, Good, Right, Morality, Natural Law, Higher Self, Higher Will, etc. to create a wonderful world of Heaven for all sentient animate beings, or we can choose to deny and reject it’s importance and continue to go downhill and create more of a Hell to live in. This is also about the alchemical process. Osiris is the Divine Incarnation. God s Idea or Archetype of Man : Potential Perfection. Isis is the Divine Mother Incarnate. Typhon is comparable to material darkness,” that which is below,” where the universal essence and life of Osiris and Isis are “slain,” in a mystical sense. Osiris, the central figure of the myth, may be considered as personifying the Divine Immanence, the Indwelling Spirit, “slain from the foundation of the world.” He is God and also Man. Son of Heaven and Child of Earth. I love your blog/website. I also really like Mark Passio, been reading his material for a year now and have posted some of his work in the past. WE have so much to learn and just when we think we learned it all, new revelations come about.